Model Driven Enterprise Engineering (MDEE) is a concept proposed by Know Gravity, a company based in Zurich, Switzerland, that has been active in modeling and requirement engineering since 2000. They propose a pragmatic approach to integration of OMG and non-OMG modeling specification, so as to cover all the modeling needs of the enterprise (and not only for software). 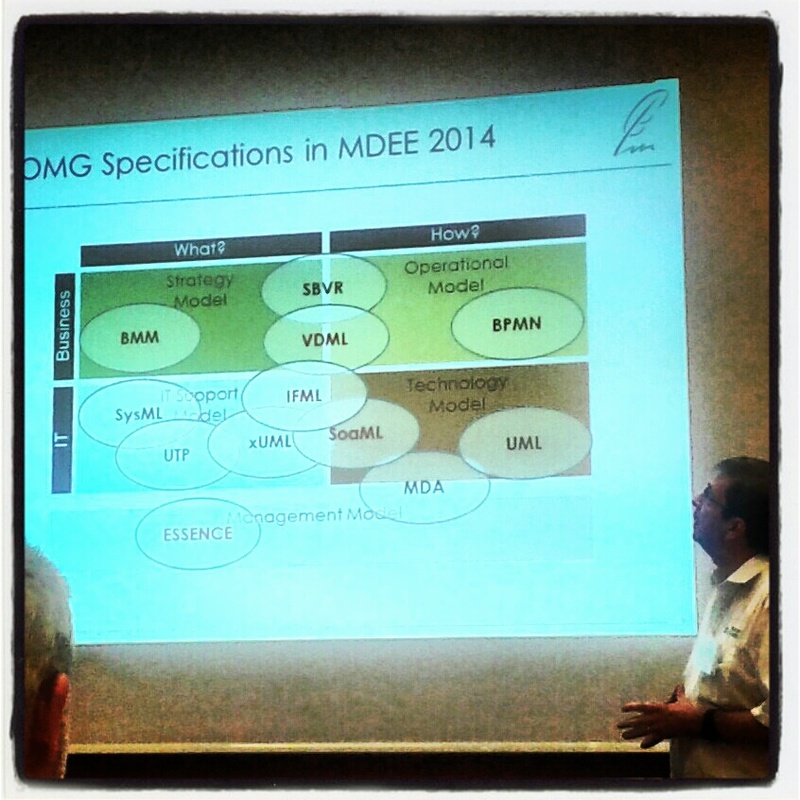 The Model Driven Enterprise Engineering framework and the mapping to the OMG modeling languages. The focus of the approach is mainly in the first stages of design, and especially on requirement, simulation and early prototyping. The approach is based on integrating and relating together multiple and diverse models, through the definition of a vocabulary (SBVR-based) and integrated metamodel. It covers project management, enterprise and system document generation, functional requirements, business rules, and many more aspects. The idea starts from the fact that using single OMG specification doesn’t make much sense, because actually many OMG business and IT specs are complementary and sometimes overlapping. Therefore there is need of alignment on meta entity level and of designing cross-model and/or cross-profile associations. The current way they do this is to have a profile-based comprehensive modeling tool, that lets you model the various aspects and related them to each other. In my opinion, this is not that different to the megamodeling approaches. The good news is that they also plan to fully support IFML (the new OMG standard called Interaction Flow Modeling Language, see also my previous post on standardization here) in the framework by 2014.
they trademarked the concept of Model Driven Enterprise Engineering! they plan to write and publish a book on the topic which will be completely automatically generated out of the models, and will be produced following software engineering processes, starting from use cases, requirements, and so on! You can find more on this at the company Web site: Know Gravity.